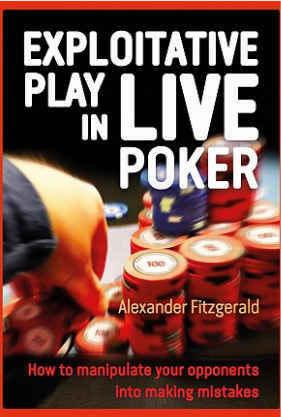 We here at ProfessionalRakeback were excited by the December 2018 release of “Exploitative Play in Live Poker: How to manipulate your opponents into making mistakes.” Published by D & B Poker, this 240-page volume is the work of poker pro Alex “Assassinato” Fitzgerald who has had considerable success in both live and online tournaments. Alex is also a poker coach who has helped countless clients fix holes in their games and improve their results at the tables. There has been a proliferation of poker training material over the past couple of decades – from books and articles to podcasts and videos. While almost every type and format of poker has seen at least some attention from strategy writers, there are those that are more popular among poker teachers and others that tend to receive short shrift. Though live poker was all that there was before the online game came around, the Moneymaker Boom enticed many to play over the internet rather than in brick-and-mortar cardrooms. Content producers shifted their focus accordingly, and to this day, most of the info that’s out there is geared toward online poker rather than live. Thus, Fitzgerald’s work had the potential to bring new insight into a form of poker that almost all of us enjoy now and again but that is sometimes ignored by other writers. Rather than focusing on things like HUD stats or GTO ranges, the author concentrates on identifying and exploiting opponents’ leaks while seated across from them at the real-life tables. In order to gauge the effectiveness of Alex’s efforts in this direction, we solicited the opinion of an actual brick-and-mortar poker player, someone who has been in the game for more than a decade and who focuses on live poker rather than online. He’s not a professional but is a skilled amateur. We feel that our reviewer represents the target demographic of the book, and so we have gladly shared his thoughts about it below. The strategies on offer attack almost all the games I play in. It was like looking into the past of everything I see at the tables and exactly what I am doing wrong at them. There are many tools and techniques explained that can be used in certain situations and how to play them profitably. The sections on continuation betting, 4-betting, and over-betting are very good reads. I could throw some numbers in here to illustrate a few of the things that the book states, but I will not. Instead, I’ll just say: Read the book, and be amazed at the analysis shown. The intro helps set up the book well with thoughts on the process and the idea of levels of play. I'm still reading this section with high interest. Chapter 2, “How Homo Sapiens Play Poker” - a helpful dive into how you are viewed at a table, how most players on the tables view themselves, and how to use this against them. Alex gives great numbers on what is being opened with out of position, and why aren't you 3-betting against these wide ranges? It’s a great question. Also, why are you calling check-raises and river bets with second and third pair? What do you beat? These are losing plays. The author gives great numbers to back up the hands a basic player is check-raising and river betting to show the right play. Exploit what the common 95% of players are doing and attack them. Very intriguing. Chapter 3, “Preflop Play” - Population tendencies is a new insight to me but a very real edge that is well thought-out on how certain regions of the world behave and attack a poker table. Great piece on varying of open raise ranges, how to view them, and what to look for. Chapter 4, “The Three-Bet” - amazing analytics on the value of the 3-bet and how the numbers are backed up to essentially show profit, when not being confronted by 4-bets continually, on any and all hands...Wow! Great quote from this chapter: “If you cannot 3-bet in tournaments, you will not succeed. If you cannot fold one pair in a tournament, you will not succeed.” There’s a detailed explanation of this concept. It really breaks down into who is 4-betting you? And with what hands? AA, KK, QQ, that's it. No one is 4-betting light here, and when your 3-bet is called in position, of course you’re winning 70% with a bet on the flop – boom! 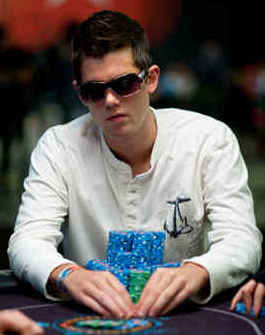 Chapter 20, “Poker and Life” - last chapter in the book, including such topics as what to do as a traveling player. Great words of wisdom on how to manage money and how to play traveling poker. How to think about loss and gain with all expenses taken into account. Note: I am not a traveling player myself, but I appreciated all the info in this section. I’m not going to provide notes on all the chapters, but I thought the ones listed above stood out. However, my personal favorites are the ones about “Passive Games” (Chapter 13) and “What’s your Edge?” (Chapter 15) simply because they talk almost word for word about the games I play in and how to attack them. It's like he was sitting at the tables with me and taking notes on all players. Crazy. After reading Fitzgerald’s volume, I decided to head down to my local cardroom and try out the strategies and tactics I learned. The style seemed to work very well at our passive club $5/$5 NL game although it did cause a lot of variance due to the large number of calls being made all the way to the river. Lost a lot of pots on the river with call downs, but when I hit, it seemed to pay off well. I didn't see a single 4-bet against any of my 3-bets all night. 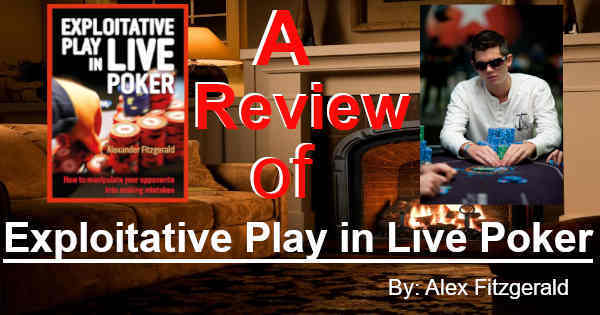 Our reviewer clearly felt that “Exploitative Play in Live Poker” was worth his time and attention, and there are plenty of others who feel the same way. The book is rated 4.7 stars on Amazon and 4.9 at Goodreads. “Exploitative Play in Live Poker: How to manipulate your opponents into making mistakes” was written by Alex Fitzgerald and published by D & B Poker. It’s available in paperback form for $29.95 and eBook for $19.95. There’s also an audiobook version on Audible for $19.95, and a Kindle edition costs $9.99.